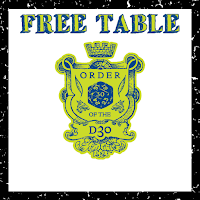 Another Free/PWYW d30 Table is up, and it's no April Fools Joke! I know...two tables in two days?! I'm almost on a roll. his d30 generator helps create mild magical poisons called Gut Busters that are used as part of a hazing/initiation ritual in certain drinking establishments. one race (Gnome Titans). I took the idea and made it a fixture of my home campaign largely because I've seen real-world examples of noxious party drinks people had to consume. A good example is the "Grog Bowl" at certain military Dining Outs (different services would have different names for the drink and the event). A little bit of light fun for April Fool's Day 2017 and a little love for the venerable d30. As usual, click on either graphic to go to the download page, or use this link.